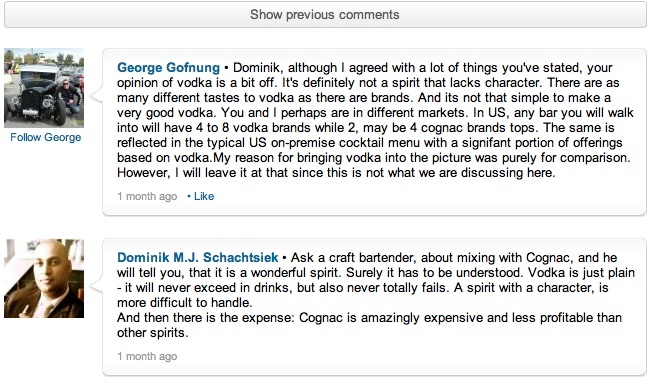 We have had a vivid discussion about Armenian brandy in one of the Linked In discussion boards. But really vodka is consumed almost 100% as mixed drink - mixed with Red Bull [argh], orange juice, cranberry juice - and sometimes as Vodka Martini cocktail. As a Martini, the differences are also muted, due to the fact, that neutral alcohol is like a sponge and assimilates other aromas - even if they are added in a very small quantity. The only big distinction between the vodka brands are entirely a marketing exercise: target group, pricing structure, style of advertisement, marketing budget and so on - you got the point! The whole success of vodka is basically based on perception - and yeah definitely deception. Am I here too opinionated? I will post an old post of my previous iteration of my blog, where I was much more "fundamental" about vodka... stay tuned!